Fiery, passionate entertainment to subtle listening grooves. 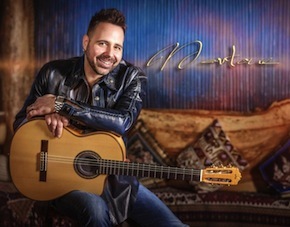 To listen to the music of Dave Martone is like experiencing a simultaneous explosion of sound, color and flavour. Sometimes over the top, sometimes minimlistic and sometimes a mixture of both, Martone never ceases to amaze with his talents on the instrument and is one of Canada’s finest guitarists to date! Dave's discography is extensive, with seven studio album releases and three live concert DVD's, as well as countless compilation albums to his credit. He has been on the cover of many Canadian Music Magazines as well as having major features in Guitar Player, Guitar World and Guitar One Magazine where Dave was voted one of the top 4 underground shredders in North America! Dave is an educator and clinician for such companies as the prestigious Berklee College of Music, The National Guitar Workshop, Workshop Live, Parker Guitars, Digitech Processing, Vox Amplification, Radial Engineering, and Cakewalk Recording Software. In addition to owning his own production facility Brainworks in Vancouver, Dave has numerous credits as a session guitarist for major record companies in Canada and the US. He has worked with the top guitarists in his field, including the likes of Joe Satriani, Steve Vai, Yangwie Malmsteen, Greg Howe, Paul Gilbert, Marty Friedman, Jennifer Batten, Chad Kroeger, and on and on. Dave has also continuously performs throughout Europe at sold-out concerts as well as toured and played in 3 Doors Down and alongside Nickelback and Puddle of Mud. If that isn"t enough he also joined Juno Award Winning band Bif Naked in Canada and is touring and recording for her next record. His latest record "Clean" has been signed to New York record company Magna Carta and finds some of the most talented guitarists of our time on it as special guests with non other than Joe Satriani playing alongside of Martone as well as Jennifer Batten who has performed with Michael Jackson for over a decade. Dave has also authored 2 books to date from Alfred Publications. "Shredding the Blues" and "Serious Shred Advanced Scales." 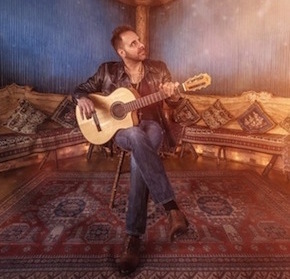 On top of his solo work, Dave is also apart of the group Kadabra, a Neuvo Flamenco band that performs throughout Vancouver. 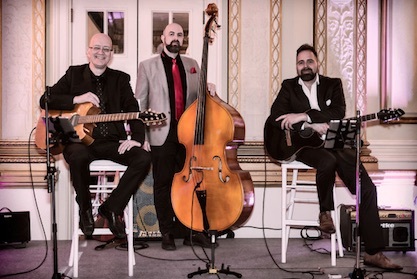 Kadabra can be tailored to be a duo, trio or quartet according to budget and venue.